Bring some Japanese flavours in to your kitchen with this quick and easy recipe perfect for a week night. 1. Preheat the oven to 200°C, gas mark 6 and roast the pork in its foil tray for 20 minutes. Meanwhile put the dashi stock into a large saucepan with the ginger, bring to a simmer for 5 minutes. 2. Pour the pork cooking liquor into the dashi, then spread the sticky sauce sachet over the meat and roast for 5 minutes. Meanwhile, add the noodles to the dashi and lay the pak choi on top, cut sides up. Cover the pan and simmer for 3 minutes, until the pak choi is just tender. 3. Slice the pork thickly and keep any sauce. 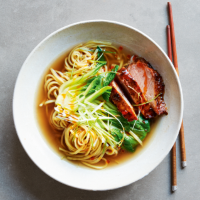 Put the noodles, pak choi and broth into large bowls, top with the pork, sauce and a mound of salad onions. Drizzle with a little chilli oil to taste and serve; toss to mix and add more chilli oil if you like your ramen really spicy.